aFrom the Department of Radiology (A.L.C., A.H.S., A.L.B., T.S.M. ), Montefiore Medical Center, Albert Einstein College of Medicine, Bronx, New YorkbDepartment of Radiological Sciences (A.L.C. ), University of California, Irvine, California. BACKGROUND AND PURPOSE: CT guidance is increasingly being used to localize the epidural space during epidural steroid injections. A common concern is that CT may be associated with significantly higher radiation doses compared with conventional fluoroscopy. The goal of this retrospective study was to determine the average dose-length product and effective dose delivered while interlaminar epidural steroid injections are performed and allow comparison with other modalities. MATERIALS AND METHODS: A total of 281 patients who had undergone 345 consecutive CT-guided epidural steroid injections of the lumbar spine were evaluated for radiation exposure. The dose-length product for each scan was derived from the CT dose index volume and scan length. Effective dose was then calculated from the dose-length product and a κ coefficient of 0.015. Procedure time was calculated from the PACS time stamp on the scout image to the last CT image of the last image series. RESULTS: The average dose-length product across all procedures was 89.6 ± 3.33 mGy·cm, which represents an effective dose of 1.34 ± 0.05 mSv. No complications from the procedure were observed, and average procedure time was 8 minutes. CONCLUSIONS: The use of a stationary table and an intermittent scanning technique allow for short procedures and doses that are significantly lower than those of conventional diagnostic CT scans. Furthermore, because CT dose index overestimates radiation dose in stationary table procedures, the actual radiation dose may be even lower than stated here. CT guidance has been increasingly adopted for use in interventional procedures of the spine, including epidural steroid injections (ESIs). ESIs are performed by injection of a corticosteroid solution, often with a local anesthetic, into the epidural space of the spine. This procedure is frequently used to treat radicular pain from herniated disks and spinal stenosis. 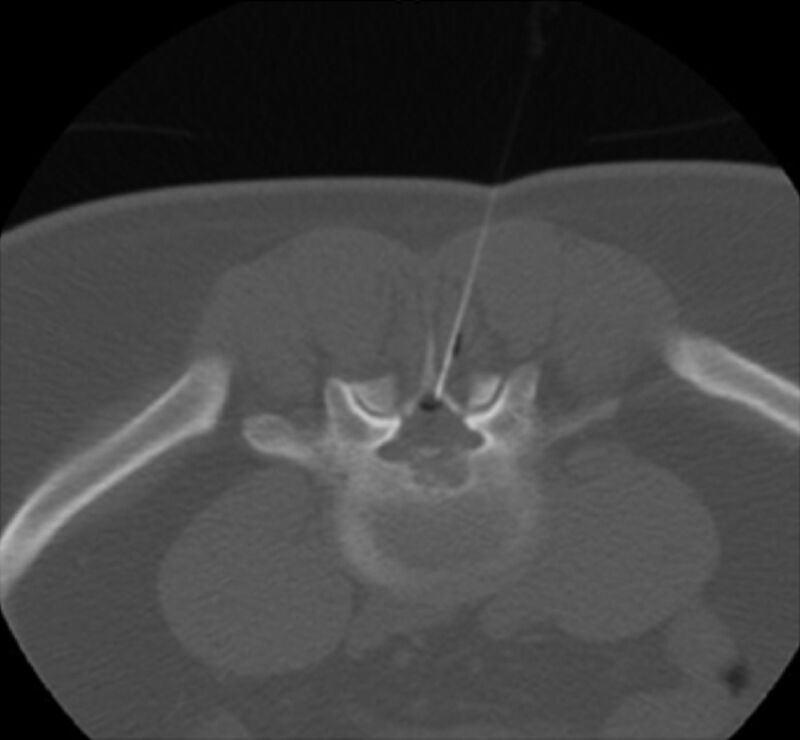 CT offers several advantages versus traditional fluoroscopy, including the ability to visualize the soft tissues and provide higher anatomic precision and more accurate needle placements, and the option of using air instead of contrast medium to localize the epidural space.1 Accurate localization of the epidural space and needle position during ESIs is crucial, as it facilitates precise delivery of medications and reduces the risks for needle misplacement and subsequent complications. Previous reports on blind injections have shown incorrect placement in up to 25% of cases, even when performed by experienced providers.2 We recently reported our experience of safely performing 1000 procedures with CT guidance and air contrast to localize the epidural space.1 The goal of this study was to analyze a cohort of similar patients to evaluate the dose-length product (DLP) and effective dose (ED) delivered while interlaminar ESI was being performed. which averages the dose over the field of view. A 16-cm diameter cylinder is used to measure CTDIw for head examinations, whereas a diameter of 32 cm is used for body examinations. and I represents the table increment in millimeters (mm) per axial scan. CTDIvol is easily calculated and is available in most scanner output dose tables. The SI unit of measurement of the dose is the milligray (mGy). Because scans of greater physical length increase with the proportion of the body exposed to radiation and thus affect the radiation dose, the DLP was developed to incorporate scan length into the dose calculation: DLP = CTDIvol × scan length (cm). 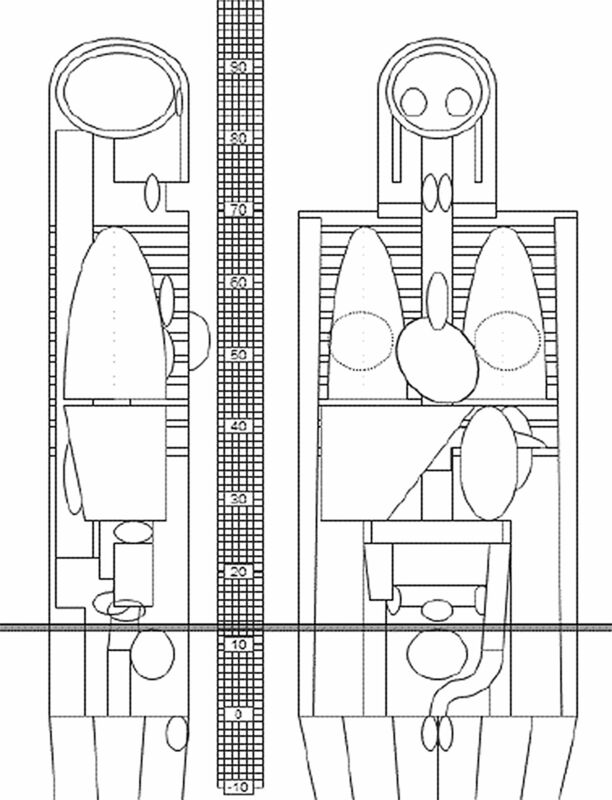 The units of DLP are in milligray centimeters (mGy-cm) and represent the total energy absorbed in the scanned volume. After receiving approval from the institutional review board, we conducted a retrospective review on 281 consecutive patients undergoing 345 CT-guided interlaminar ESIs in the lumbar spine at a single institution during an 8-month period. All procedures were performed by 1 of 3 interventional neuroradiologists who perform at least 500 CT-guided procedures annually. Patients were seen in an office consultation before the procedure, monitored for 1 hour immediately after the procedure, contacted by phone at 24 hours, and seen in the office 1 month later. There are several different modes possible with CT; one option is to use CT in a fluoroscopic mode, which provides continuous real-time image collection in a manner similar to traditional fluoroscopy. Another option is to use intermittent scans, where single images are taken serially, either with a foot pedal or remotely at the control station. These scans all occur on a stationary table, so that the same cross section is continually acquired. In our study, images were obtained by use of an intermittent scanning mode. The procedures were conducted at 120 kVp and 50 mA; in a few instances, the milliampere needed to be increased to provide better resolution in patients with a large body habitus. CTDIvol and DLP displayed in the CT scanner dose report were recorded for each patient. The CTDIvol was also measured under standard conditions with acrylic phantoms and compared with the displayed value to verify its accuracy. The mean deviation of measured versus reported dose was +1.9% (range, −6% to +12% across scanners). The images for each patient were individually reviewed to ensure that each procedure was correctly categorized. We obtained procedure time by comparing the scout image with the last CT image. Approximate anatomic region used in ImPACT dosimetry software. A total of 281 patients underwent 345 CT-guided lumbar ESIs via an interlaminar approach. The average patient age was 59.7 years, 206 (59.7%) were women, and 139 (40.2%) were men. The mean DLP for all procedures was 89.6 ± 3.33 mGy·cm, and the median value was 78.34 mGy·cm. By use of the above-stated ED/DLP conversion factor (also known as the coefficient) of 15 μSv/mGy·cm, the obtained mean DLP converts to an estimated ED of 1.34 ± 0.05 mSv. Average procedure time was 8.4 ± 0.4 minutes, beginning from scout image acquisition to the last axial image acquired. No complications were observed during the procedure or at 1-month office follow-up. The use of CT as a guidance technique for minimally invasive procedures has brought many advantages and innovations. The traditional drawback to CT use has been its association with increased risk from higher radiation exposures than fluoroscopy.10,11 There are several reasons to quantify radiation exposure in lumbar ESIs. Multiple ESIs are not uncommon for pain relief in some patients, some of whom present at a relatively young age. Repeated radiation exposure over the same anatomic area can increase both deterministic and stochastic radiation-related risks, which makes the determination of exposure from any diagnostic or therapeutic study important. In our study, the average DLP from use of an interlaminar approach for ESIs was 89.6 ± 3.33 mGy·cm while using an intermittent scanning mode. The conversion of our average DLP to ED by an ED/DLP factor of 15 μSv/mGy·cm yields a value of 1.34 ± 0.05 mSv. By comparison, the average background radiation dose per person in the United States is approximately 3.11 mSv per year, and a regular CT of the abdomen/pelvis is approximately 10 mSv.12 Intermittent scans also have the advantage of decreasing radiation exposure to the patient and operator,13 with the potential to completely eliminate exposure to the operator when image acquisition is initiated from within the shielded control station. Our value compares favorably to lumbar radiographs in the lumbar spine, with an estimated 1–1.5 mSv in studies done in the United Kingdom, by the NRCP, and by the UNSCEAR.12,14⇓–16 Schmid et al17 conducted simulations by using Rando phantoms (The Phantom Library, Salem, New York) and estimated that the ED from 4–10 intermittent CT scans ranged from 1.51–3.53 mSv, with 4 scans estimated to be the average number necessary. Thus, our results are near the general predicted range. Schmid et al17 also found that 1–3 minutes of conventional fluoroscopy yielded an ED of 0.41–1.25 mSv, respectively, with 1 minute being the estimated average fluoroscopy time necessary. Kim et al18 also performed a study using phantoms to estimate ESI dose with conventional fluoroscopy and found an estimated ED of 0.93 mSv from a mean clinical procedure time of 40.7 seconds (range, 14.3–95.9 seconds). A limitation of any study measuring radiation exposure involves the differences between studies in machine types, settings, and even operator skill, which can all affect the exposure time and dose. However, these studies do provide a useful context for understanding and comparing our results with known data on predicted doses for intermittent scans and conventional fluoroscopy. A few values in our data were found to be causing a positive skew in our DLP; although the mean was 89.6 mGy·cm, the median value was 78.34 mGy·cm, and the DLP ranged from 11.67–826.91. When evaluating all cases both above and below 2 SDs of the mean, we found 6 outliers, all of which were greater than the mean. After reviewing these cases individually (Table), we determined that in most cases of high DLP, the tube current had been increased to improve poor resolution in images because of excessive soft tissue mass in obese patients. In other cases, technically difficult studies contributed to long procedure times and greater CT usage. In a single case, the tube current had been incorrectly set to a higher value used in diagnostic imaging. Any of these factors can increase the received dosage. In addition, multiple factors could have caused overestimation of dose. High dose and time outliers typically occur in patients with a very large body habitus, where a higher milliampere is required to maintain adequate image resolution (Figs 2 and 3).21,22 This also underscores that ED data should not be used to estimate any given person's individual risk as age and body habitus significantly alter their radiation exposure, but rather as a parameter to compare exposures across different studies and procedures. 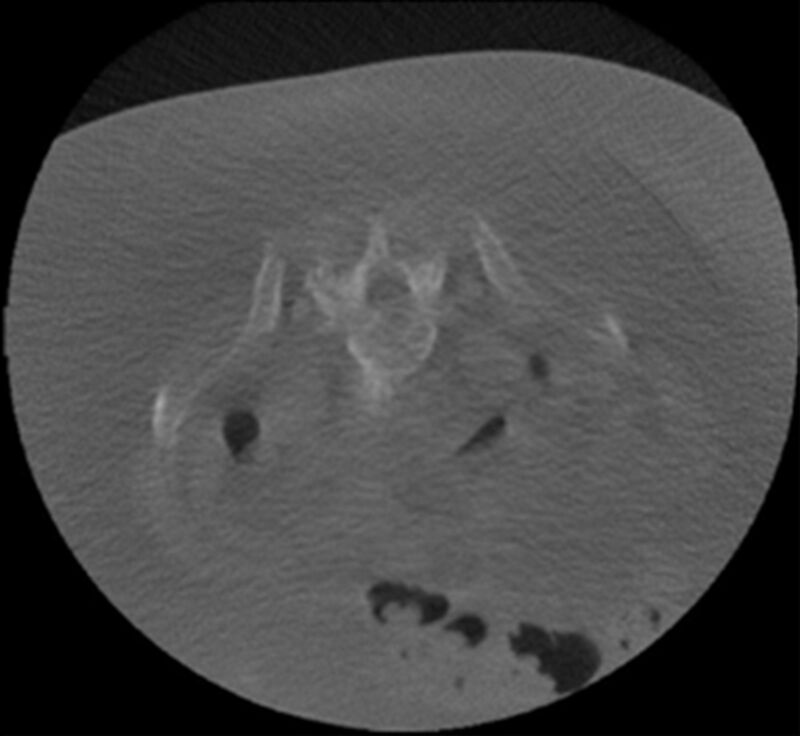 CT guidance used to localize the epidural space with adequate visualization by use of air contrast. Limited resolution with 50 mA on a patient with a very large body habitus. A factor that can cause an overestimation of ED stems from how CTDI is defined. The definition of CTDI assumes that the table is incrementally advanced through a scan length, which does not apply to interventional procedures utilizing a stationary table. CTDI includes the dose tails resulting from scatter in the integration of the dose, and these dose tails are reduced when a stationary table is used. Several groups have measured the peak skin dose to be only 50%–65% of the stated CTDI100.3,23,24 In fact, Leng et al23 used a correction factor of 0.6 × CTDIvol to correct for the dose in interventional intermittent stationary table scans. This finding implies that the intermittent CT dose is potentially even lower than the result reported here. Without very thin thermoluminescent or solid-state dosimeters, it is difficult to know how much lower the actual dose is than when estimated by the CTDI, and doing so would be a next logical step for further research. The future of CT guidance for procedures in the spine is promising. The ability of CT to provide precise 3D needle localization combined with the radiation exposure results seen here, along with ongoing research currently being conducted on dose reduction methods for CT guidance,25 provides great future potential for the use of CT in spinal procedures. The use of an intermittent scan mode can provide the advantages of CT guidance without necessarily subjecting the patient to excessive radiation; our study found an average ED of 1.34 ± 0.05 mSv per interlaminar ESI in the lumbar spine while using an intermittent scanning mode. Accepted after revision January 22, 2013.